Project Title: "Molecular markers for Identifying cardamom accessions"
Objectives: DNA fingerprinting of small cardamom accessions. Project Title: "Biodiesel Production: Sago processing industrial wastewater as feedstock for the microbial production of oils and derived co-products"
Objectives of the Study:To produce microbial lipids from sago processing wastewater using oleaginous fungi. To improve lipid production and co/by-product formation by studying the physiological response of oleaginous fungi on sago processing wastewater. To understand the relationship of nutrient removal with lipid production and enzyme production by oleaginous fungi on sago processing wastewater. To recycle treated wastewater for tuber washing and irrigation purpose. To scale up and test the biodiesel properties of microbially produced lipids. Objective of the Study: 1) Determine the genetic variation of folates and carotenoids levels in whole seed, seed coats, cotyledons and embryo axis in selected genotypes of peas, chickpea and bean germplasm and commercial cultivars grown in Saskatchewan. 2) To find out the Genotype x Environment influence for carotenoids and folates in selected genotypes of pea, chickpea, dry bean and lentil. Objective of the Study: Introgression of Saltol locus from salinity tolerant FL478 into popular varieties of Tamil Nadu in INDIA. Developing a segregating population involving the above parents. Marker Assisted Selection (MAS) was done using SSR markers linked to “saltol” locus in parents and 260 F2 plants. Molecular studies assisted along with Co-workers. Root phenotyping: Root phenotyping and screening of the IR 20, Nootripathu and F11 RILs and 1500 Nagina22 Mutant lines of M3, M4, M5 and M6 generations. Root traits studied: Plant height (cm), Root penetration ability, Number of roots per plant, Root thickness (μm), Seminal root length (cm), No. of crown roots, No. of lateral roots present in seminal roots, No. of lateral roots present in crown roots, presence or absence of root cap, root cell length (μm), cell width (μm) and No. of cells in 100 μm bar of rice roots. Short root mutant was identified and confirmed by root morphological, cyto-histological and expression profiling studies. Short root mutant was confirmed molecular level by using SSR marker. Drought tolerant protein difference was expressed from leaf tissues by SDS-PAGE and 2D-PAGE. 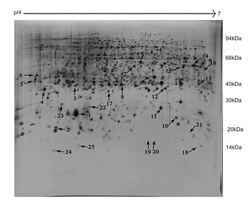 Expression profiling analysis was done between differentially expressed protein spots. ADT 36, ADT39, CO43 and White Ponni (Susceptible cultivars). Submergence stress was induced artificially and identified tolerant & intolerant cultivars. Obtained significant ABA quantity between control and stressed samples using HPLC. Developing a segregating population involving the above parents and Marker Assisted Selection (MAS) was done using SSR markers linked to Sub1 locus in parents and 256 F2 plants. 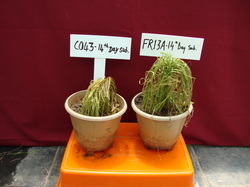 The selected F2 generation plants (CO43 X FR13A) were studied for yield and yield related traits. Objective of the Study: To explore the identification and characterization of salinity tolerance in N22 mutant lines. Salt Stress conditions imposed: Stress (100mM NaCl) was induced on 15 days old plants and scoring was done after 7 -10 days. 100, 150, 200 and 250mM NaCl were also used for salinity stress induced on germination stage. 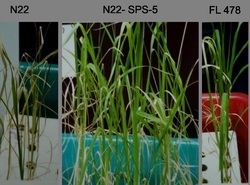 3 putative mutant lines (N22-SPS-5, N22-293 and N22-334-3) screened for the salt tolerance in M3 generation and advanced to next generation. Parental survey was done between N22 and salt tolerant lines using SSR primers. The selected 3 salt tolerant mutant lines were used to introgression of salinity tolerance gene in commercial rice cultivars grown in Tamil Nadu. Objective of the Study: To explore the possibility of transferring the genes responsible for seed oil content in cotton through intra-hirsutum crosses. Hybrids/parents evaluated: Twenty-eight hybrids, four adapted varieties and the seven G. hirsutum genetic accessions. Studies Made: Mean, per se performance, GCA, SCA variance & Heterosis. The studied characters (including seed oil) exhibited non additive gene action. Surabhi and F 776 were good general combiners for seed oil and 2.5 per cent span length. 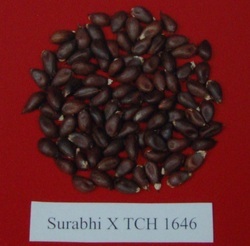 The hybrid Surabhi x TCH 1646, were exhibited highest seed oil content. Explored the possibility of developing hybrids with high seed oil through heterosis breeding.